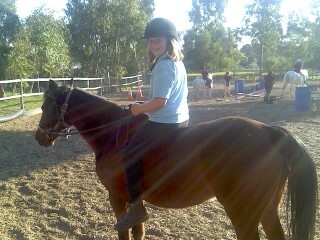 It's the first time she's ridden without a saddle and it's on a horse she's never ridden before! She did slide off twice - which was quite funny - but as you can see she's enjoying herself. Looks like she's having a blast! LOL, hell, I've 'slid' off horses WITH a saddle... And she does look like she's enjoying it! Nothing quite so much fun for a kid as riding a horse! Very cute!